News from LMCU: Save Money on All of Your Purchases! Save Money on All of Your Purchases! Get 3% back on all gasoline purchases*, 2% back on all groceries and 1% back on everything else with our Max Rewards Platinum Visa Card. The Max Rewards card has no annual fee, no balance transfer fees, and the ability to redeem points for cash, travel or merchandise. For a limited time, take advantage of 2.99% APR* for 12 months on all purchases and balance transfers when you open an account between now and June 30, 2012!**. Plus we’ll give you 1,000 points when you make your first purchase and 5,000 additional points when you reach $500 in purchases! 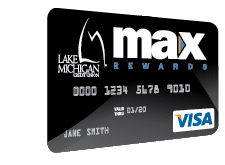 Apply for your Max Rewards Card today Just call, click or visit any of our branch locations. *APR = Annual Percentage Rate. Max Rewards Platinum Visa pays 3 points for every dollar spent on gasoline. Each point can be redeemed for 1 cent. Maximum earned on first $500 spent on gas/month, 1% after maximum is reached. **Cash advances not included, 12 months begins from date of account opening. Excludes existing LMCU balances.